Janette Hamilton (Everydogsmom) with her "Significantly similar" husky/lab cross Nakita, a rescue abandoned at 8 weeks of age because she had too much energy for her owner. Hey folks! Hope everyone is healthy and doing well since last I wrote! Our pack is doing well with their training and some of them will be ready to seek forever homes soon. I have become extremely busy in the past few months, so we are retiring from active rescue for a while. We will of course still deal with any emergencies, but we are putting our training program on the back burner for now while I write the book on training rescues to live in the average home. Some of my friends in rescue have been waiting for me to write this book others may not care, but my book is not what I wanted to discuss with you today. Having been in the rescue business for as long as I have, you tend to meet like minded people. I have a rescue friend in Wisconsin that I speak with regularily. He does things pretty much the same way I do, taking in unwanted, strayed and abandoned dogs and retraining them until they are “bullet proof” in other words training them to live in the average dog ignorant home without issues. He’s good at it and to date they have rehomed many dogs successfully. We talk from time to time and let each other know what’s going on in our rescue work. It was during one of these conversations over this past weekend that we discussed the topic I am about to introduce. 1. Moving (7%) Many people claim that they can not find a place to live that will allow them to keep their pets. I say they haven’t looked hard enough. After all if you have children you wouldn’t take the first vacancy that came along in an all adult building now would you? If you have committed your life to a pet you should seek new accomodation that allows for that committment. Pets are not disposable, and there are many rentals out there that do not mind pets. I don’t know about your area but I do know that here in Ontario landlords can not descriminate against people with pets, it is against the law. The only reason they get away with it is too few people are aware of this. 2. Family member died and no one wants their pet (6%) Seriously? Please can you not understand that your dead relative dedicated their life to this animal, can you really not find it in your heart to care for them until their final days? You loved Grandma with all your heart, yet you can not extend that love to her pet? Don’t you think she would want you to give that pet a home? 3. Too many animals in household (4%) This one really pisses me off, I mean really? You are the one who is responsible for bringing pets into your home. You knew before you brought this one home that you already had more than you could handle, so why did you bring him home in the first place? 4. Cost of pet maintenance (5%) Of course there is a cost to pet maintenance, and you knew there would be when you got your pet. Did you not factor that into your monthly budget? When we decide to have a child (unless it is an accidental pregnancy) do we not calculate the expenses involved? The same should hold true when deciding to bring a pet into your home. Even if your financial situation changes, it is no reason to get rid of a family member, after all you wouldn’t rehome your kids because you lost your job would you? 6.Allergies (14%) Seems that half the world is suddenly allergic to dogs! What irritates me most about this excuse is it usually comes in the form of “we just had a baby and the baby is allergic to dogs.” Now speaking from the perspective of someone who has been allergic to dogs for years (I was tested at the age of fifteen and it was determined I am actually allergic to both dogs and horses two of my most favorite animals) this is a BS excuse no matter who is using it! It is physically impossible to determine the source of an allergy without scratch testing and most people do not have newborns tested. It is generally an excuse used to hide the fact that these pet owners are too lazy to care for both a pet and a baby. 7. No homes available for litter mates (3%) This is such a bogus excuse! If you had of had your dog spayed in the first place you would not be having this problem! Spay and neuter your pets people! It is the RESPONSIBLE thing to do! 8. Having no time for pet (4%) Seriously? I run a media company, work as a photographer, write a magazine, perform live, and still I find time for my eight dogs! Why because I MAKE the time for them. They come before my leisure activities simply because they are family. You have ONE dog and say you don’t have time for it? I call shenanigans! 9. Pet illness(es) or pet has grown old (4%) Honestly this has to be one of the worst excuses I have ever heard! Your pet is ill so you decide to abandon it instead of care for it? Your pet is a senior so you can’t be bothered to care for it anymore? What is wrong with you? That animal has given you the best years of its life, and now when it needs you most you are walking away? Shame on you! 10. Biting (3%) If your dog has bitten you, for heaven sakes use the tools available to correct the behavior. Use a muzzle and work with your dog until it develops bite inhibition. Surrendering a dog that has bitten to a shelter is merely a death sentence for the dog! If you still feel you must get rid of the dog because you are clueless as to how to stop the behavior, at least seek out a rescue that is known for rehabilitation of difficult dogs. At least that way your dog will have a fighting chance at being rehomed. Besides 9 times out of ten a dog bites because the owner has unknowingly provoked it. Perhaps instead of getting rid of the pet you should learn how to handle it? Well I guess that’s my rant for the day. Take it as you will. I know some of you will argue my points, but as far as I am concerned, there is no good excuse for abandoning an animal. Many of my rescue friends would agree, and many average citizens would argue that I am wrong, however, I firmly believe that once you add a furry family member to your human family they should be a part of that family for life! No matter what! Summer’s Here! Is Your Backyard Safe for Your Dog? With training my rescues and, attempting to build my media company I have not had time of late to write. However, it is the time of year when I usually talk about backyard safety for your dog. The weather is getting nicer, and the summer will soon be upon us. Do you know what hazards lie in your back yard? Well we are about to tell you! I was awakened this morning as I am every morning, by a fourteen year old Chi-pom I inherited last winter during one of the coldest weeks of March 2011. Someone had left him taped up in a box and discarded outside a local business. When they found him he was almost dead from the cold. They called me because they knew the little guy would probably never make it out of a shelter alive due to his advanced age. Now he lives with me, and he has found his niche in life as my alarm clock. His name is Chester. After Chester awakens me and I have seen to my morning toilet, I head downstairs where my husband (wonderful man that he can be sometimes) has already made the coffee, having already exercised the dogs, and supervised the morning run. Coffee in hand I head to the livingroom to boot up my computer. I am followed by an entourage of small breed rescues we affectionately call “Mom’s Minions”. As I sit down at my desk, Harley the Schnoodle sits in front of me wanting good morning pats. Harley is the pack’s “town crier” he keeps us all up to date on what’s happening around the house. No leaf shall blow by unannounced while Harley is on watch! As I sit and give him his required morning greeting he tells me all about the things that went bump in the night. He is happy with this routine, he feels it is his job to keep me apprised of all goings on. Once Harley has made the morning report, it is Hercules turn to have one on one time with “the Mom.” Hercules came to me over three years ago. He was rescued in a puppy mill raid in March of 2009, and came to me that July. He had been adopted out several times but then returned because no one could touch him. We were his last hope, we took him in without batting an eyelash, knowing full well he would probably spend the rest of his natural life in our home. Three years later, Herc is still unadoptable, but with my husband and I he feels safe and comfortable. He is the pack jester. It is impossible not to start the day out with a smile with this little guy around. When Herc has finished his morning comedy routine, I spend the next couple of hours answering correspondence, making phone calls, and dealing with the less glamorous aspects of the rock photography business. Then it is time for my daily walk with Phoenix our 120 lb great Dane cross. Phoenix came to us just over a year ago. He’d had somewhat of a checkered past, had bitten a few people due to his fear. Once again we were a dog’s last hope. It fell to us to rehabilitate him or have him become a statistic. That was a year ago and now Phoenix is a happy go lucky dog who loves new people. There is no trace of the old fear in his eyes when you look at him. Phoenix has been reborn. When Phoenix and I arrive home we let the rest of the pack out into the big backyard for a run. All the dogs run and play together,, we do not seperate large breed from small breed. I have been criticized for this by people who believe that large breed and small breed dogs should be kept away from each other for safety, however I do not agree. I believe that if you are going to socialize a dog properly, it must learn to get along with all sizes and shapes of dog, not just those comparable in size. The Great Dane must learn to play gently with the Chihuahua, and the Chihuahua must learn it’s boundaries with the Great Dane. All in a safe, and controlled, SUPERVISED environment of course! After the mid morning run, it is nap time. Everyone settles down in their favorite spot, and takes a nap while I practice my music. After an hour or two of practice it is time for another run, then household chores. At the end of the day when my husband gets home from work he takes the pack out for another run. We will then make dinner together, feed the dogs, run them one last time before bed, and call it a night. Tomorrow morning we will do it all over again, and I wouldn’t miss a minute of it! So next time you meet someone like me, don’t ask us how we do it, ask us why. Because that is really the important question here is it not? The truly important thing about my life is not how I manage, but why I have to. 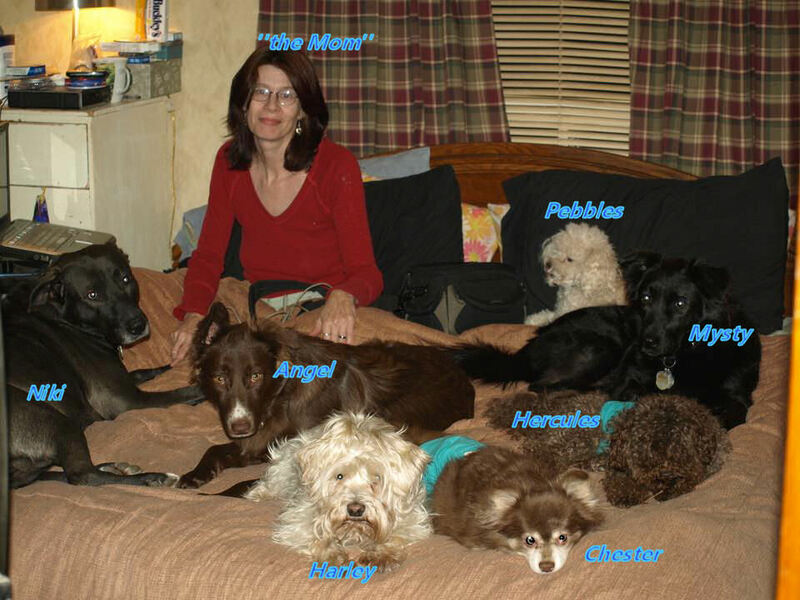 Everyone calls me “the crazy dog lady.” After all who in their right mind would live with that many dogs? I’ll tell you who, those of us that are tired of the disposable way in which companion animals are treated. Those of us who spend our lives cleaning up the messes that less caring people in society leave behind, that’s who! BE THE CHANGE YOU SEEK!! !